With lunchtime seven days a week, Utsav offers a $21.95 all-you-can-eat Indian buffet consisting of nearly three dozen dishes. 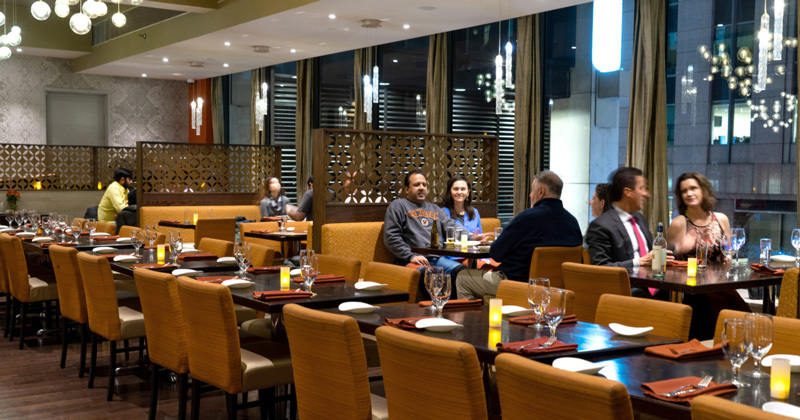 The food is various and subtly spiced, and always includes tandoori chicken, saag paneer, dal makhani, lentil salads, and a shrimp or lamb dish, plus a choice of two desserts. Warm bread is delivered at intervals. The views of the skyscrapers all around the second story dining room, and the elegance of the space are other pluses. The chance to overeat so profoundly makes the price worthwhile. Note: The entrance is on 47th Street. 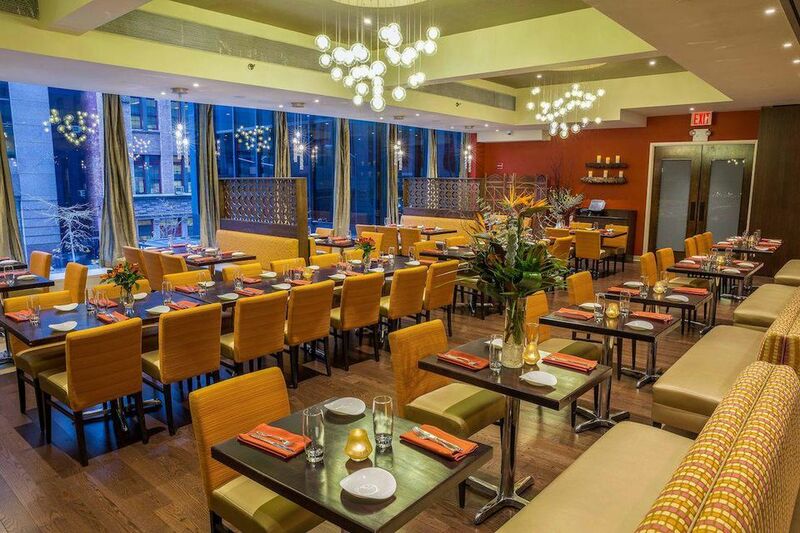 This place is famous among midtown curry hounds for its generous and reasonably priced lunch buffet. The cozy, plum-and-saffron dining room resembles an upscale cafeteria in a suburban Mumbai mall but the menu includes creations from all over the subcontinent, like delectable Kashmiri lamb rogan josh and Goan giant shrimp in a coconut-tamarind sauce. The Dahi palak kabab playfully reinvents saag paneer as patties of spinach and ricotta. You’ll hate how much you like the Utsav salad’s mango mayonnaise (you read that correctly). The menu can be overwhelming, so feel free to retreat into the comfort of a $40, three-course prix fixe; it has only 144 possible combinations (a gross has never tasted so good). It’s been a bit over three years since I last visited Utsav (from a Sanskrit word meaning “festival”), and my admiration for its cooking has only increased. While the menu hasn’t radically changed from my earlier visit, the food I tasted certainly ranked with the very best Indian cuisine in New York, and the prices—especially in this high rent location across from Rockefeller Center and a block from Times Square—are on average cheaper than a competitor like Junoon. And it would be hard to match Utsav’s consistently fine service staff, whose cordiality and efficiency in delivering successive dishes make dining a pure pleasure, all under the direction of owner Nandita Khanna and Manager Jerry Joseph.